I Googled and Amazoned, and here were my favorite 7 I found – what do you think? The blurb on Amazon says it best: “Send someone our newest gift basket, the Stimulus Bill Gift Basket. Who doesn’t want to be bailed out… You can’t spend it, but at least you can enjoy eating it! 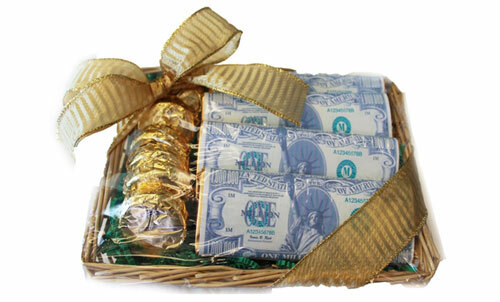 Help the economy, keep spending and send some chocolate money to your friends and family.” Hah! And they say money doesn’t grow on trees! 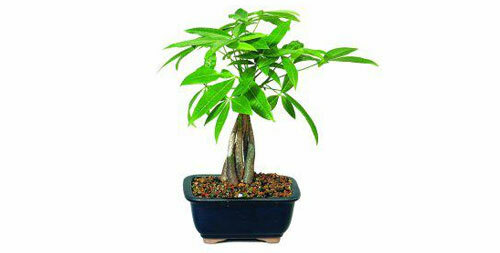 (Bah dum-ching) Seriously though, did you even *know* about these money trees?? I first came across them when planning our home garden the other month (there’s “normal” money trees too that aren’t bonsai), but they required more work than I wanted to put in. Like watering and staying away from bad weather ;) But they would be cool to have for sure… esp. this mini one. Hahaha…. This is by far my favorite. Cheap enough to stock up on and give as stocking stuffers/gag gifts, but awesome enough to actually use too – at least in my blogger office ;) I don’t know what screams financial blogger more than dollar bill toilet paper?! Maybe I’ll even sneak it in our master bedroom and see what the Mrs. says, haha… I hope she’s not reading this right now. I hope you enjoyed today’s list! It’s 2.5 hours of searching around I’ll never get back ;) If I missed any others you know about, though, let me know… maybe I’ll put together a round two when I don’t feel like doing any “real” work again, haha… to capitalism! PS: Here’s the list for the best hidden safes I’ve found in the past too, along with those manly banks. I would love to receive a basket of Stimulus Bill! 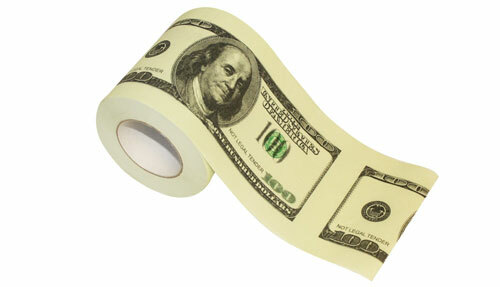 And yes, the money toilet paper roll is a cute gag gift. I gave my 5 yr a Monopoly Junior Game. 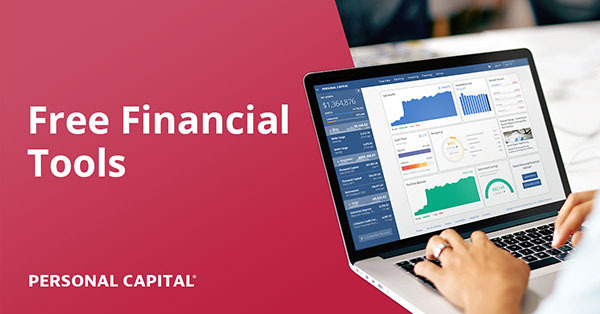 There is nothing best to show them how money comes… and goes! hahaha! We’ve thought about getting my girlfriend’s dad a stock certificate for Harley Davidson but decided it wasn’t worth it. 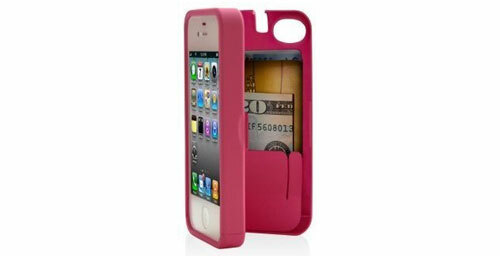 It’d be cool but would eventually just collect dust. The money toilet paper roll is classic. I am just picturing a friend coming over to use the washroom and seeing that! I’m lovin’ the money toilet paper roll!! My dog would love the Bone Digger! 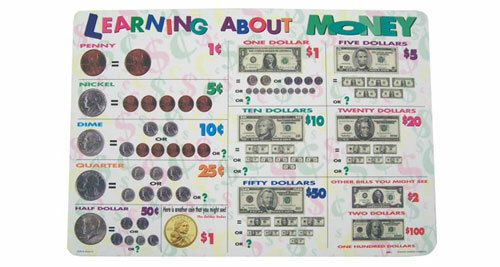 I need to buy that money placemat for Vinny like yesterday! In fact, why am I even commenting right now? I need to go to Amazon NOW! I killed my last money tree. Really hope it wasn’t symbolic. I keep a money tree in my office just to bring me good luck! This is perfect timing as I’m trying to come up with some birthday/christmas gift ideas for the nieces and nephews. I’ve been leaning towards getting them $2 bills thanks to you, but I’m looking at the stock certificates and that place mat now too. I’m the financially responsible sibling, so got to pass on the interest to the little ones! Isn’t “In Dog We Trust” Dog the Bounty Hunter’s saying? 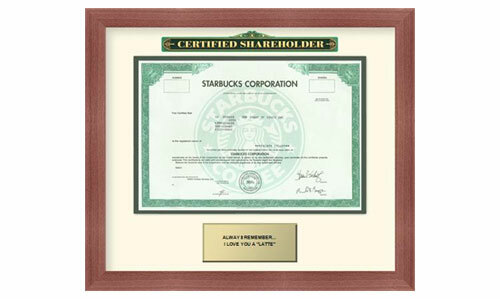 Funny, I have two stock certificates at home that I just leave in my safe… Guess I never thought of hanging them up. Of course they value of them is a little more than something I just want to leave on the wall. But a single share might be fun! @Em – Awesome! Go for it!! @Jenna, Adaptu Community Manager – HAH! That is awesome!! And weird? @Joe @ Retire By 40 – I think it’s all electronic these days. The certificates are probably just for show (though I could be wrong). Previous post: New Chrome in Our Kitchen! Next post: What Will YOU Leave The Next Generation?